The New York eviction notice forms are used when a tenant has either failed to pay rent, or is breaching the lease in some way, or is holding over after a lease has ended. The forms are a way for a landlord to inform the tenant that they are getting ready to take court action if the tenant doesn’t either rectify the problem or move out. If the tenant doesn’t not respond to the notice, the landlord can then go to court to file a Petition and Notice of Petition. The New York court system has Do-it-Yourself online forms. 3-Day Notice to Quit (Non-Payment) – This form is used if the tenant has failed to pay the rent when it is due. The tenant will have three (3) days to respond to the notice before you can file a petition with the court. This form is also known as a “Demand for Rent”. For additional help use the Guide for Non-Paying Tenants. 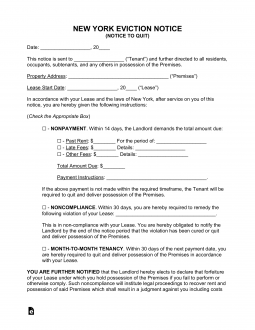 10-Day Notice to Quit (Non-Compliance) – This form is used when the tenant is breaching a lease term. The tenant will have ten days to respond before the landlord can go to court. 30-Day Notice to Quit (Month to Month) – This form is for use to let the tenant know that a month-to-month lease will end at the end of thirty days. Rent is due on the date specified in the lease. If the tenant fails to pay when due, landlord is entitled to send a three day notice demanding payment of rent. Step 1 – Before a landlord can go to court, he has to provide requisite notice to the tenant. If it is for non payment of rent, he should provide This 3-day Notice. If the tenant has failed to abide by other terms of the lease, the landlord should provide This 10-day Notice. If the landlord wants to let a month-to-month tenant that there will be no renewal of the lease, he should use this 30-day Notice Form. Step 2 – If the tenant fails to comply with the notice and continues to breach the lease by not paying rent, violating the lease terms or holding over after a lease term is up, landlord may then file a Petition with the Local City, Village or Town Court if the property in question is outside of New York City, or with the Housing Court if the property is inside New York City. Most forms have to be Notarized before they can be filed with the court. Step 4 – The tenant will then have a chance to show up at court and dispute the matter, or will not show up. In either case, if the landlord receives a judgment, the tenant will have to move out. In order to receive help from the sheriff, the landlord will have to get a Judgment and a Warrant for Eviction. Step 5 – Once you have these forms signed by the court, you can deliver them to the sheriff who will provide a notice of eviction to the tenant. The tenant will then have 72 hours to move out before he or she is forced out. The New York Notice To Quit form is readily accessible through the PDF, ODT, or Word buttons near the image. It is imperative that all information on the Lease being focused on be presented exactly as it appears in the Lease so make sure you have a copy of this document handy when filling out this form. The first item requiring a specific definition will be the Addressee of this document. Report the Name of the person, or persons, this Notice must provide information to on the first line. Locate the first sentence below the Recipient Name. In the spaces after the phrases “City of” and “County of,” report the City and the County of the Rented Property, respectively. Then enter the Zip Code in the appropriate area. The space after the phrase “number and street,” document the Rented Property’s Building Number and Street. The last blank space has been provided so you may report the Apartment Number. Locate the phrase “day of” in the second sentence of this document. Use the spaces provided around this phrase to enter the Signature Date reported on the Lease this Notice concerns itself with. For a Notice to Pay an Overdue Rent within three days or turn over possession of the Rented Property to the Landlord or designated Agent, choose the “Nonpayment” check box. This requires the Name of an Authorized Agent to be reported on the first blank space. Then, enter the Total Amount of Money the Tenant owes on the blank spaces preceding and following the word “Dollars.” The last statement requires the dollar amount that must be paid as a result of this Notice. The final piece of information will be the Rental Period this dollar amount is attached to. For a Notice to Comply with the Lease terms or turn the premises over to the Landlord within Ten Days, mark the second check box. The blank line in this statement will require the exact Violation the Recipient has committed in relation to the Lease Agreement to be presented. If the point of this Notice is to provide the exact Termination Date of a Month To Month Tenancy, then either the third or the fourth check box will need to be marked. For a Termination Notice to be issued to the Tenant, where the Landlord shall end the Lease Agreement with the Tenant thirty days (or more) after the Receipt Date of this Notice, then check the third check box. The Date the Agreement terminates will need to be reported as a Calendar Day, Month, and Year using the blank spaces in this sentence. For a Termination Notice to be issued to the Landlord, where the Tenant shall end the Lease Agreement with the Landlord at least thirty days from the Notice Receipt Date, then check the fourth check box. This Date of Lease Termination must be entered in the appropriate blank areas of this sentence. The Disclosure Paragraph at the bottom of this page will require the Landlord/Agent Signature on the blank line. The final area of this document is the “Certificate of Service” section. The Deliverer is the only entity who may fill this part of the Notice out. Also, this section may only be filled at the time of Delivery. The Certificate statement will require the Calendar Date and Identity of the initial Recipient of this document to be reported on the blank spaces available. The second part of this Certificate will be three choices to define how this Notice was Delivered. By checking the appropriate check box, the Deliverer will indicate if the Notice was Delivered personally to the individual(s) it addresses first hand, if the Notice was Delivered to a household member or other such reliable person, or if it was mailed using the United States Postal Service First Class Mail. Once this section has been completed, the Deliverer must Sign his or her Name.